1) Carbon consists of the maximum covalency of 4 and can't form complex compounds. 2) Carbon is the single element in the group which can form stable derivatives with double and triple bonds, which exhibit special characteristics. 3) Carbon makes gaseous oxides, that is, CO and CO2 while others form the solid oxides. 4) Carbon consists of a much higher electronegativity and higher ionization energy than the other elements in the group. 5) Carbon consists of a unique capacity of catenation and makes a very large number of stable compounds, having long chains or rings of carbon atoms that can take place in numerous isomeric forms. 6) Carbon makes stronger bonds not just with itself however as well with elements such as halogens, oxygen, nitrogen and sulphur than any other element in the group. The crust of earth is largely comprised of silica and silicates, which are the principal components of all the rocks and sands, clays and soils which are the breakdown products of rocks. Most of the inorganic building materials are mainly based on silicate minerals. These comprise natural silicates like sandstone, granite and slate, and manufactured materials like cement, concrete and ordinary glass. Several properties and vital uses of silica and silicates are illustrated below. Silicon dioxide, SiO2, is generally termed as silica. It's amorphous and also crystalline forms are well-known. Flint is the amorphous form of silica. The crystalline forms are quartz, tridymite and cristobalite that encompass various structures. Quartz is the most stable and purest form of silica. It is a colourless solid encompassing a specific gravity of 2.65 and is as well termed as rock crystal. Each and every crystalline form can exist in two modifications, one stable at lower temperatures whereas the other at high temperatures. Such forms can be inter-converted with the modification in temperature. In the hydrolysis of silicon tetrachloride, silicic acid is obtained that on drying and ignition provides silica as a fine white powder. Such reactions are employed in the analytical chemistry. Silica is acidic in nature and provides silicates whenever fused with alkalis. SiO2 differs from CO2 in a significant respect that it is a solid at room temperature while CO2 is a gas. We are familiar that CO2 is a simple linear molecule in which the carbon is attached to two oxygen atoms by means of two double bonds. 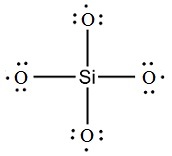 On the other hand, SiO2 makes a giant or macromolecular structure in which each and every silicon atom is surrounded tetrahedrally via four covalently bonded oxygen atoms and each and every oxygen, in turn, is bonded to two silicon atoms (shown in figure below). Though, the overall Stoichiometry or the silicon-oxygen ratio remains similar, that is, SiO2. The [SiO4]4- tetrahedra can be symbolized in three ways as illustrated in the figure shown below. One silicate distinct from the other only in the way in which the units are linked altogether. The simple silicates are salts of orthosilicic acid, H4SiO4 contain the orthosilicate ion 4, [SiO4]4-, illustration Zr4+SiO4-. In several silicates, the oxygen atoms of SiO4 units tend to complete their octet via sharing electrons by other silicon atoms, the oxygen atoms, therefore, form bridges of the kind Si-O-Si to other silicon atoms. The number of such bridges can differ from one to four. This leads to the formation of complex silicates. Any oxygen that fails to pick up electrons from the other silicon atom is not capable to complete its octet. The resultant silicate chains are, thus, negatively charged anions. The metal cations usually present in silicate minerals are Li+, Na+, K+, Ca2+, Al3+ and so on. Based upon the way such SiO4 units are linked, silicates of various structure and complexity are obtained. A few representative kinds are represented in the figure shown below. 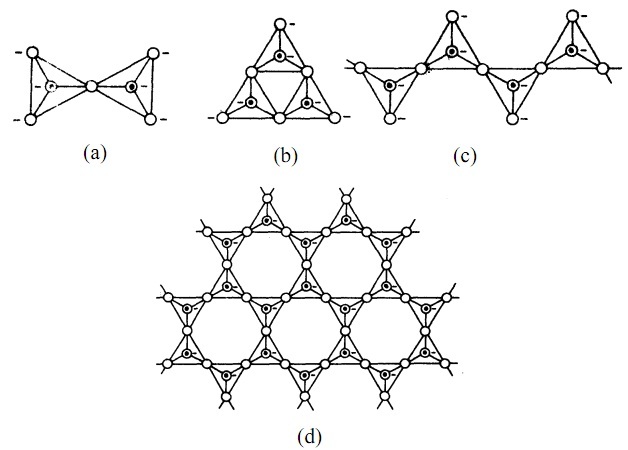 In addition to the kinds where linkages between SiO4 units are two-dimensional (2-D), complex silicates yield from three dimensional (3-D) linkages between SiO4 tetrahedra. Silicate industry is a very significant industry and it plays a significant role in the national economy. From such mineral silicates, glass, ceramics, cement and so on are 38 manufactured. Micas are the layer structured silicates. They encompass toughness, elasticity, high dielectric strength, transparency, chemical inertness and thermal stability up to 775 K. Thus, mica sheets are employed for furnace windows, for electrical insulation and in the vacuum tubes. Asbestos are the fibrous silicates. They encompass high tensile strength, great flexibility, and resistance both to heat and flame and as well to corrosion by acids or alkalis and are low cost materials. Asbestos is employed as a thermal insulator for lagging steam pipes, for making fire proof textiles and as insulator. Prolonged exposure to airborne suspensions of asbestos fibre dust can be extremely dangerous and there has been increasing anxiety at the occurrence of asbestosis. Clays are necessary components of soils, made up by weathering and decomposition of the igneous rocks. Whenever mixed with water, clays become soft, plastic and moldable. Clays have been employed since times immemorial for pottery and for making tiles, bricks and so on. Some of the clays such as fuller's earth encompass high adsorptive capacity and marked cation exchange properties. They are broadly employed as oil and grease absorbents in the petroleum industry. Talc is valued for its smoothness, softness, dry lubricating properties and chemical inertness. Its whiteness makes it appropriate for use in cosmetic and toilet preparations and also in the ceramics and paper industry. The fundamental raw materials for cement manufacture are lime, silica and alumina. Portland cement is acquired by calcining an appropriate mixture of limestone and clayey material and adding small amounts of gypsum and powdering the mixture. This powdered mixture hardens to a solid mass on reacting by water and provides a water resistant product. Cement slurry alone or mixed by sand or concrete can be made up to set in any desired shape. This property makes it an exceptional building material. Zeolites, as well termed as Permutits, are sodium aluminosilicates employed in softening of water. These are employed as cation exchangers and eliminate the Ca2+ and Mg2+ ions from hard water. The calcium and magnesium salts of permutit can be transformed back to the sodium salt via treatment by a concentrated solution of sodium chloride. Whenever a mixture of silicates mostly of sodium and calcium is melted and then super cooled, that is, cooled instantaneously to a low temperature, a transparent solid is obtained which is termed as glass. There are many varieties of glass however most of them are a mixture of either merely different silicates or mixture of borates and silicates. Borates make glass heat resistant. Borate glasses such as Borosil are employed for making laboratory and kitchen ware. Lead glasses encompass a very high refractive power and are employed for making optical components such as lenses, prisms and so on. Sodium glasses are soft, substitution of sodium via potassium makes glass hard. Introduction of an appropriate amount of different colored metallic oxides forms the glass colored. Metallic oxides employed are Cu2O, Fe2O3, U3O8, MnO2, NiO, Co2O3, etc. giving red, green, yellow, violet, black and blue colours to the glass, correspondingly. Silicones are a group of organosilicon polymers. Dissimilar SiCl4 which on complete hydrolysis provides SiO2, alkyl substituted chlorosilanes on hydrolysis don't give the expected silicon compound analogous to ketone however get hydrolyzed to long chain polymers or silicones. Whereas the hydrolysis of trialkylmonochlorosilane yields linear gilicone polymer hexalkyldisiloxane, the alkyldichlorosilane provides straight chain polymers by active hydroxyl groups at each and every end of the chain and trichlorosilane provides complex cross-linked polymers. The chain size is limited via the size of alkyl group and the amount of cross-linking is governed by the relative amounts of di- and tri-methyl-chlorosilanes. Therefore silicones having desired properties can be obtained as oils, greases or rubbers. They are chemically inert, heat resistant up to ~500K, water repellent, good-electrical insulators and exhibit little viscosity change with temperature. They are employed as insulators, lubricants, protective coating and heating oils.